Don played a very significant part in the foundation of the Solent Fellowship Band, and he was appointed Band Secretary at the time of its inauguration on 25th October 1996. He was one of the founding fathers, and was regarded as its guide, mentor, and protector for many years. Don had great diplomatic skills: and was very much an adept negotiator. With representatives of many Corps in the Band, active in their own Corps Bands, dates for band concerts have to be arranged in order not to clash with Corps, and Divisional activities. And this necessitated considerable co-ordination and no little persuasion at times. In his time, he very successfully arranged close to a hundred concerts: in Salvation Army Corps over a wide area: in a variety of Churches, large and small, from the magnificent Romsey Abbey to the delightful and charming C12th St Mary’s on Hayling Island and the Victorian St Agatha’s Church in Portsmouth; and occasionally in school halls. Assiduous and competent, and in control of the detail without losing sight of the whole, Don always ensured that everyone knew what was happening, circulating regular updates on the rehearsal and concert schedule and ensuring that we all knew exactly where concerts were being held and the content of the programme. Don was appointed Band Secretary of The Portsmouth Citadel Band in the days of Bandmaster Harold Nobes and Deputy Bandmaster Lloyd Bates. And that was over 60 years ago. He grew up at Portsmouth Citadel. His great, great grandfather, James Bailey (on his mother's side) helped start the corps with Catherine Booth. Don was taught to play the cornet in 1939, but with the advent of World War Two, his family moved to East Meon remaining there until 1945. During his time at East Meon he was a chorister in the choir of the local Church. 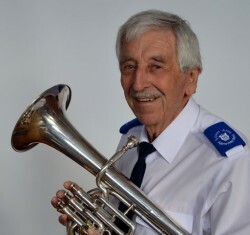 On returning to Portsmouth for a short period of time he played in the Junior Band before joining the Portsmouth Citadel Band and he remained a member until 1975. Having moved away from the corps he worshipped at Southsea and Winchester before returning once again to Portsmouth where he was to soldier and be part of the corps until his promotion to glory. Whilst away from Portsmouth he spent around 20 years playing in contesting bands - mainly Ocean Brass, previously known as Southampton Central and he also guested on occasions with The Woodfalls Band, Solent Concert Band and Lucketts Travel Band. Don still played golf until very recently when the time was spent visiting his wife Hazel in hospital and a home. Don played to a high standard and was captain of the local senior mens team though in latter years he played off a high handicap of 26, he enjoyed cricket and supported Pompey FC, sharing the few triumphs and many disasters of the team since he saw his first game at Fratton Park in 1940! Don started his working life as a carpenter and joiner apprentice at the Fareham based construction company, Healy and Evans rising to become a very successful managing director for many years before retiring. In 1983 Don became a member of the Rotary Club of Fareham, he was club President during 1992/1993, and club secretary for the period 1998 –2003, and he was awarded a Paul Harris Fellowship for services to Rotary International in 2004. We have to accept, with sadness, that Salvation Army Banding has been in decline for some time now with fewer and smaller bands, in many cases maintained by the denizens of the Third Age! However Don waged his own very successful war against this decline: from the very beginning he adopted a quite deliberate policy that he would get as many former Salvation Army Bandsmen back into playing as he could. His success can be measured in that he ‘rescued’ a complete Band – some 28 of us have returned to SA banding and of those at least a half have resumed playing in Corps Bands, all as a result of Dons efforts through The Fellowship Band. Bands can have fine musicians, excellent conductors, wonderful soloists, and often cohere collectively into immense musical teams. But behind every great band is a Band Secretary, or organising secretary or whatever the nomenclature: always unsung, often not noticed, giving endless hours, often dealing with fractious situations and, certainly in the SA, giving endlessly of their time and financial resources without any thought of repayment. They are the real heroes of banding. Don was the very epitome of this. So Don not only helped found the Band, and run the secretarial aspects with great ability and success for nearly 17 years but he also recovered the equivalent of a complete band! And Don combined all this with being the Band’s excellent solo horn player. Don retired from the Band Secretary role at the beginning of 2013 but continued to contribute to the musical aspect on 2nd Horn until the very end. His contribution to the band and to the Salvation Army is truly beyond measure. Thank you Don. If there were a “Hero of Banding” Award “With Honours”, it would be yours! He will no doubt now be inline for the organising role of the heavenly Orchestra! You will be missed Don.